These four Liverpool lads are making a name for themselves this year. On the festival circuit they’ve been gracing the stages of Glastonbury, Field Day and Green Man to name but a few, and their debut LP, ‘Highest Point In Cliff Town’, is due to be released on Heavenly Recordings on August 28th. The Shtooks are a Bedford-based quartet who provide a contemporary twist on blues rock by combining their soul and indie-influences to produce something truly unique. Since forming in 2013, Andrew Hubbard, Lawrence Felice, Carlo Felice and Sean Tobin have worked tirelessly, releasing their debut EP Papa Ganoosh in July 2014. Bursting onto the scene right now is 20 year old Aylee, currently being championed by Radio One BBC Introducing. Hailing from the Highland’s, Aylee is in good company. She has naturally been compared to fellow Scots Chvrches and Prides but what sets Aylee apart from her peers is her musical ability. PEERLESS: May 4th - SOLD OUT! Over the past week we've had some incredible musicians feature on our two PEERLESS nights at The Waiting Room. 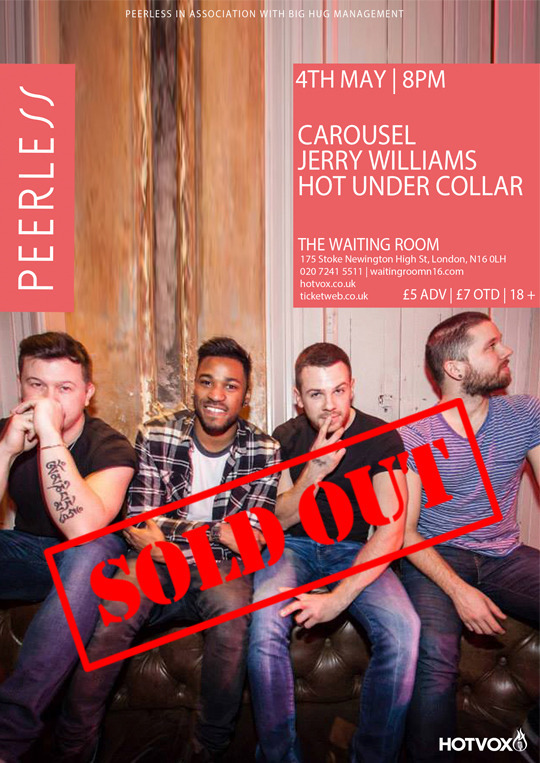 Following the success of Dead Cannons, Michael Baker and JJ Hodari just last week, on May 4th Carousel, Jerry Williams and Hot Under Collar played to a full to capacity venue as tickets sold out within minutes of doors opening! Read more about PEERLESS: May 4th - SOLD OUT! Following a really successful PEERLESS night at The Waiting Room last night, today we can finally reveal our last PEERLESS artist – Hot Under Collar – completing the bill for May 4th. With our first PEERLESS show just around the corner, we're releasing the final line up this weekend! Latest to be added to the bill on April 28th at the Waiting Room is the incredibly talented JJ Hodari.